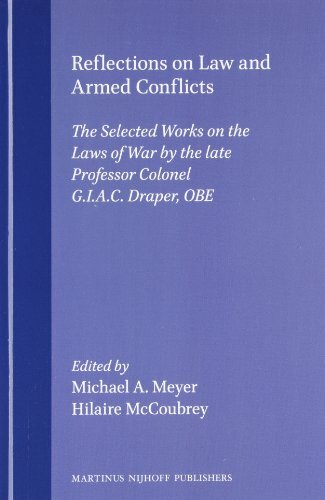 This unique volume presents an edited selection of works upon the laws of armed conflict by the late Professor Colonel G. I. A. D. Draper, OBE. Professor Colonel Draper was a central figure in the analysis and dissemination of the humanitarian laws of armed conflict in the English-speaking world. He had a wide practical and academic experience of the subject including service as a prosecutor at the Nuremberg trials. His work covered not only the contemporary substance of the law but also its moral, ethical and political context, the pressures upon its development and its potential for further positive, and other, development. This edited collection presents a very significant part of Professor Colonel Draper's work, including many pieces which are no longer readily accessible or have never before been published, with modern commentary referring to developments which have occurred since his death. The late Professor Colonel's work is an important scholarly contribution to the subject and also retains a very great degree of modern relevance, including comment upon such issues as war crimes and appropriate responses to them. The Editors present this collection as both an important scholarly and practical resource and a fitting tribute to one of the great twentieth century contributors to this area of law. '<i>This important work has two main aims, in respect of both of which it is oustandingly successful. Its first aim is to pay a highly deserved tribute to the memory of Professor Colonel G.I.A.D. Draper, OBE, who died ten years ago and was, and remains, a world authority on a somewhat underrated part of international law, namely the `jus in bello', which sets rules as to the way in which, or the extent to which, hostilities can be conducted. As the editors point out, this part of international law has been somewhat neglected, due partly to the fear (denounced by Draper as spurious) that concern for the way that hostilities are conducted might be regarded as conceding the lawfulness of the hostilities themselves. [...] It is, however, in carrying out the second aim of the book under review (which is to make more readily available the heritage of written work left by Draper) that the editors have made their major contribution. [...] In short, although this is a book which cannot easily be adequately covered in a review of acceptable length, it must be highly recommended for what it tells us about a man of exceptional personal quality with a formidable expertise in a field of international law, the relevance of which has in recent times been made evident in Rwanda, in the former Yugoslavia and in Iraq, as well as the War Crimes Tribunal set up at The Hague.</i>'<br />Norman S. Marsh, <i>the International and Comparative Law Quarterly</i>, (1999). <br />'<i> Reflections on the Law and Armed Conflict belongs in the library of anyone interested in the development and present status of the law of armed conflict.</i>'<br /><i>American Journal of International Law</i>, October 2000.<br />'<i>The book makes useful and challenging reading.</i>'<br /><i>International Review of the Red Cross</i>, 89:834 (June 1999).